Mature trees make a valuable addition to any landscape. They provide beauty and shade, and fruit trees offer a fresh snack when the season is right. Like any living thing, trees need special care. Keeping them trimmed and disease-free is essential to maintaining their beauty and value. If a tree becomes too sick it poses a safety hazard to other trees, surrounding buildings, or even people, thus there are times when complete tree removal is necessary. ArborPro Tree Experts has decades of experience and utilizes the most advanced equipment and up-to-date techniques to keep you, your existing landscape, home, and any nearby structures safe. Diagnosing problems with trees requires an expert with experience treating diseases who can recommend the best course of action. While it is a good idea to schedule annual maintenance, there are a few symptoms homeowners can look out for on their own, in between visits from a certified arborist. There are a number of diseases which can infect trees. However, if tree trimming or appropriate treatment is administered, then the spread of infection can be stopped. Unchecked problems increase the risk of spreading the disease, creating trees that have become safety hazards, and may eventually require tree removal. Annual check-ups with an arborist will not only improve the life of your trees, but keep your property safe and beautiful. 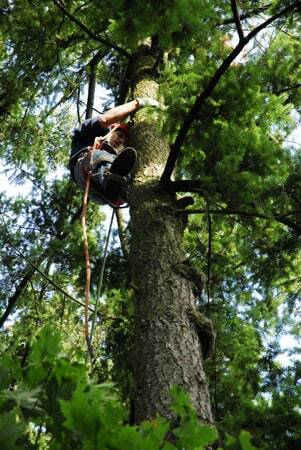 If you are in need of tree trimming or tree removal service in Tualatin, ArborPro Tree Experts has the knowledge and expertise to deliver the quality results you want. Regardless of the size of the job, we are capable of providing the best service while staying within your budget and time limit. If you have concerns about the health of your trees, schedule one of ArborPro Tree Experts’ Certified Consulting Arborists to perform a Tree Risk Assessment and Health Evaluation. Whatever your tree care needs may be, the professionals at ArborPro Tree Experts can take care of them and give you peace of mind.